You are currently browsing the tag archive for the ‘search markets’ tag. It’s here! BlackRock launched the much-discussed fixed income crossing network. BlackRock Solutions will operate the network for the benefit of it’s own managers and a network of forty-six external clients. BlackRock, alone, manages $3.5t in assets across ten thousand portfolios, but the Aladdin Trading Network –the network’s working title– will also include sovereign-wealth funds, insurance companies and other money managers. For a small fee, participants can cross trades for corporate bonds, mortgage securities and other assets through the platform. Fixed income trading has been a profitable mainstay of investment banks. The prospect of electronic trading through a crossing network is simultaneously laughable and terrifying. Given the vast investable universe of fixed income instruments, trading these instruments presents a far more complex problem than equities. GE has only one ticker, but it may have a dozen or more credit instruments associated with it, each with its own maturities, rates, claims, etc. Nonetheless, BlackRock is not moving forward on the basis of charity. They want to cut costs, and that means cutting into investment banking profits. BlackRock’s magical, mystery service has many miles to go before we see the disruption people have predicted. They currently cross 3% of trades internally, and they hope to raise that number to 6-8% with Aladdin. What’s exciting is that they’re bringing forty-six external clients along for the ride. —Ross Dawson, a self-described globally recognized leading futurist, entrepreneur, keynote speaker, strategy advisor, and bestselling author, opining on the state of expert networks. Not really. It turns out that LinkedIn went down the expert network road some time back, but to no avail. It hired management consultants. It built out a research-staff. It held preliminary discussions with hedge-funds, investment banks, and others, but in the end, it shut it down. So no, it’s not an expert network, and it hasn’t been one for some time now. Ross is a smart guy. Why the mistake? The mistake lies in a simple confusion of concepts. LinkedIn is a professional network. It’s organized like a directory. It has experts. You can use it to find experts, but calling LinkedIn an expert network is a lot like calling the membership-directory of the IEEE an expert network. Sure, there are a lot of talented engineers in there. You can even sort them by employer, location, and with the IEEE profile-data, very specific expertise, but at the end of the day, it’s just a more detailed phone-book. It’s a directory, and a directory does not an expert network make. Expert networks not only allow you to find an expert. That’s the easy part — the part you can do with a directory like LinkedIn, an IEEE directory or the phone book. Expert networks provide tools to facilitate the full life-cycle of an interaction between an expert and a client. These entail the stages over which Ross glosses when he says, “It is a little more effort to negotiate terms and make payments than it is on an existing platform, but it isn’t hard to do.” That’s a lot like saying, “all you really need for a restaurant is some food and a kitchen, right?” Neither statement is all you have to worry about to get started, and neither venture is that easy. An expert network solves three problems. First, discovery. It surfaces those experts, niche or otherwise, whom you need to know. Second, it manages the engagement from qualification to contracts and compliance to connections to compensation. Third, it builds a repository of all past connections for both experts and clients. It’s the combination of everything – the systems, policies, compliance – that makes it work. Otherwise, it’s just a directory. LinkedIn has provided a boon to expert networks. They’ve made it immeasurably easier to discover experts and arrange to reach them. 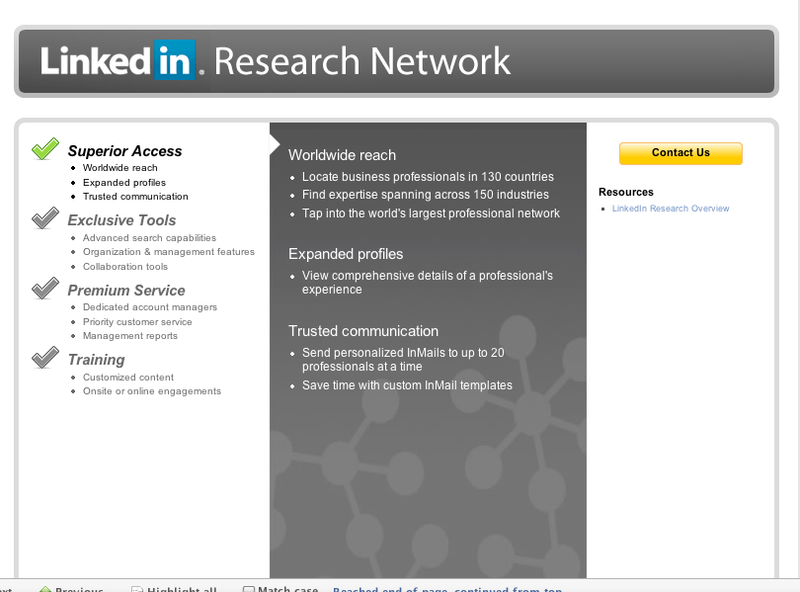 Firms like Gerson Lehrman Group, Guidepoint, Coleman Research, Cognolink and others are probably very large clients of LinkedIn’s premium features. LinkedIn has even signed a little discussed, though exclusive and expensive, marketing partnership with DeMatteo Moness, a minor expert network. Notwithstanding the exclusivity of the arrangement, DeMatteo remains a marginal player. The evolution of expert networks is just beginning. Ross is right to expect changes, but he’s missing some of the detail that will illuminate where the model is actually headed. He’s not alone, though. The many smokescreens, from the insider trading scandal emanating from so many connections fostered through Primary Global, to the fabulously successful IPO of LinkedIn, have either written expert networks off or suggested that they’re nothing more than a directory with a little more effort. From a competitive standpoint, it’s taken everyone’s eye off the inner-workings of what really makes them tick and scared them from even experimenting with the model. It couldn’t be a better opportunity for companies like Gerson Lehrman Group to consolidate their position in an industry defined by unrelenting growth. Retail cannot be algorithmically driven. Great retail is all about that sense of adventure and discovery. The next wave on this space is really rich social interaction, using video, using media, to achieve that. The Economist drafted a typically cheeky and wonderfully entertaining gloss on the current state of expert networks. For the most part, they get it right, but they also get it wrong in important ways. No, Wini Jiau is not a player in the expert network industry. She was a consultant whose information was the envy and downfall of the investment community and is alleged to have persistently acquired and sold material non-public information to a loose band of investors. The Economist would have done better to mention Don Chu, who did work at Primary Global and did confess to trading in inside information. Wini was just a consultant. Yes, because of what may eventually be described as a systematic conspiracy by Primary Global to trade in inside information through a vast network of corrupt insiders, both alleged and confessed, eyebrows have been raised. Regulators, investors, and limited partners have awakened to the risks inherent in any research activity. No, these risks are not particular to expert networks. Indeed, an example elaborated by the Economist actually suggests the opposite – that expert networks might serve as a kind of prophylactic to the kinds of funny-business to and for which we have recently seen many confessed and convicted. It’s certainly possible, but isn’t it also an argument for expert networks. If expert networks are so darn difficult about compliance that an adroit and corrupt investor would choose to circumvent them, then shouldn’t “compliance chiefs” relish the chilling effect expert networks have on their employees’ baser instincts? I did enjoy, however, their clever turn of phrase to a conclusion. Indeed, Rajat could have used some expertise in discretion. Though perhaps he could have learned it through the policies, procedures and systems of an expert network. The expert network brand has been severely damaged. Most insider-trading investigations to date have more to do with direct, corrupt relationships between insiders and their investment brethren. But these became synonymous with the handful of exchanges alleged to have been facilitated by the likes of Guidepoint Global and Primary Global. 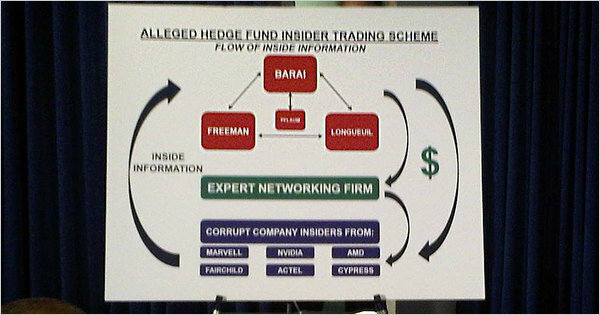 Through a failure of analysis, insider trading and expert networks became one and the same. DealBook: How Far Will Insider Trading Inquiry Expand? Be the first to know about selective sales, in-store promotions, new product launches and fashion must-haves. Don’t miss out.Sign up today. When I was an analyst, I used build my own network. I’d spot names in magazines where someone was quoted about a company and call them — that’s part of doing fundamental research. Steve Cohen has had among the highest returns in the industry….Insiders in the business for a long time suspected that his special sources amounted to privileged information. The debate amongst insiders was, “Was the special information on the right side of legality or the wrong side?” But I think it was a pretty common view that it was close to the edge…. When you have somebody who doesn’t appear to have that readily identifiable edge, who nonetheless makes much higher returns than other people, you wonder. —Sebastian Mallaby, author of More Money Than God. He went on to share that “in the past, successful investors constructed their own expert networks,” just like Dan Chung, which he attributed to the master networking skills of those such as Julian Robertson, when who you knew was the currency, and those that were known were former executives and outside of the circle of those normally considered insiders. So if what Julian did was ok, why won’t Mallaby afford Steve Cohen the same safe-harbor? Is it any different than a service which will connect anyone else to former executives and others outside of the circle of those normally considered insiders? After all, it’s hard to see a difference in kind between what Julian and Steve are described as having done. The interview merely insinuates. It does not specify: via LA Times update – this was also posted as a comment on the LA Times blog-piece, but they seem to have removed it. The McClellans might have thought that they could conceal their illegal scheme by having close relatives make illegal trades offshore. They were wrong. The whole concept of expert networks is a bit of a smokescreen here because if you think about it, it’s impossible to be an analyst on Wall Street unless you have an expert network. —James Kinnucan, Broadband Research, remarking on the media’s association of expert networks with an expanded insider trading investigation by the SEC: Interview by David Faber on CNBC. Kinnucan, of the fresh faced eager beaver fame.